The wine corks name/place card holders are such a unique idee! I cannot wait to use them at my own wedding which will be held on a vineyard! !They are definitely heavy enough to stand on their own & do not have to worry about them falling over & they look great as soon as they arrive! The place card holders are great. They are very useful to me because we are having a wedding based around Italy and Wine Vinyards. We are having an outdoor wedding and using them for the table numbers, menus, and food cards on the buffet table. They are heavy enough so we don't have to worry about them blowing away or rolling away. I tried to make them myself with real corks but they just crumbled so this is a great alternative and not too expensive! Love them. I bought these to hold the place cards at my (wine-themed) wedding breakfast. They were perfect. Just the right size, looked convincingly like corks, slightly flattened on the bottom so they sit nicely and with some weight so that they won't go anywhere. Priced well too. I ordered samples of these wine cork place card holders for my upcoming wedding. I was thrilled to see that they were exactly what we were looking for. One thing I would change about them is their size. I was hoping they would be a little bigger. Otherwise, I love them, and plan to order them for our wedding. Q:Do the little cards/paper come with? Whether you're hosting a wine themed engagement party or planning a vineyard wedding, don't just set the tables—set the tone! 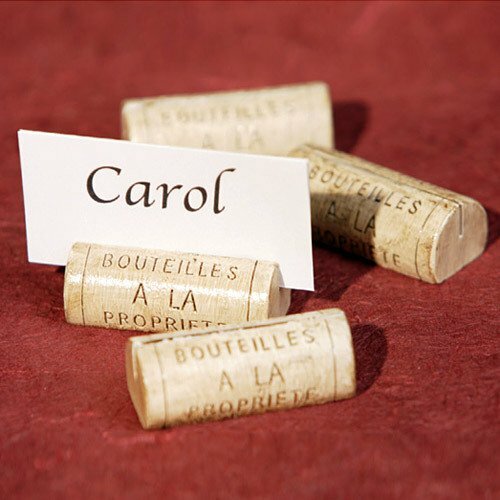 These wine cork place card holders perfectly capture the essence of any wine lover's event. Realistic detailing and genuine resin will convince your guests that each unique place card holder came straight from your best bottle of red. Each practical table decoration features a discreet card slot and flat base. Measures 2"L x 0.75"H.
Complement each place setting at your wine-themed wedding with a matching wine cork candle. For favors to please any wine enthusiast, peruse our selection of wine-themed wedding favors.